Anyone who downloads files from around the web, ftp, torrents, and elsewhere will eventually wind up with a lot of archive clutter sitting around on their Mac in the form of tons of zip, rar, sit, and other compressed file formats. This is because the default behavior is set for archives to maintain their existence even after their contents are extracted, a reasonable but conservative setting that can cause users to forget about the original archive file(s). 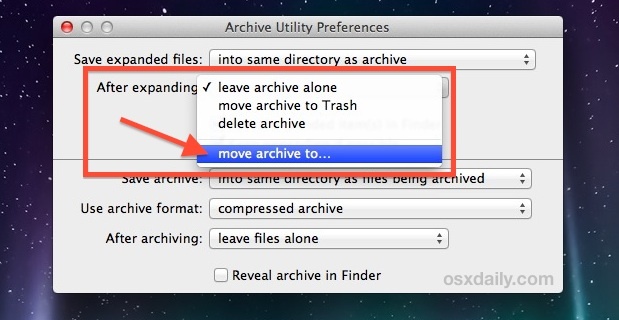 Rather than having an unruly mess of compressed file containers scattered throughout the OS X file system, a better solution for many is to adjust the Archive Utility preferences to automatically relocate the origin archive to a central folder after the contents have been extracted, this insures you’ll only have a single place to look for archives and makes it much easier to manage. Now anytime an archive has been expanded, it will relocate the original archive .zip file to that folder, keeping them in a central location. This makes manual archive backups simple, and also prevents you from having to dig around ~/Downloads/, ~/Desktop, ~/Documents/ and elsewhere to track them all down. You may have noticed another much more aggressive option in the “After expanding” options that causes the archives to automatically remove themselves after expansion. That optional “delete archive” setting is typically best suited for advanced users because it’s unforgiving, which makes using the “move to” setting a better solution for most users. This setting will apply to all archive formats managed by the native Archive Utility app. If you use a third party extraction tool like The Unarchiver to handle other file formats, you would have to set that separately to relocate those files to the same folder. Going the other direction, you can also adjust the compression actions to relocate the origin files after having been zipped, though that is probably not a good idea for most use cases since it will relocate files automatically which goes against standard operating file system expectations.